Number of new BlackBerry 10 phones are still growing nad users need backup or synchronize contacts with other devices. For these purposes there is a simple solution PhoneCopy.com, which we've prepared this tutorial for. Alternatively you can visit our BlackBerry video guide on our YouTube channel. Choose Advanced, which is bellow the image. Choose Microsoft Exchange ActiveSync in Advanced Setup. Fill in everything, what is important.Type phonecopy into boxes Decription and domain , fill in your username, email address and password. Type www.phonecopy.com as Server address and turn on just "Use SSL". If you press the button Done, synchronisation start automatically. 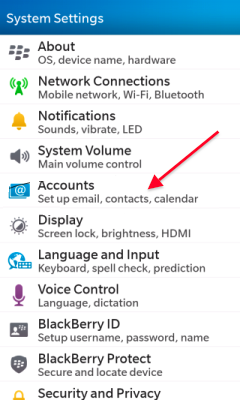 If you add new contacts into phonecopy or your phone, next synchronisation start automatically. 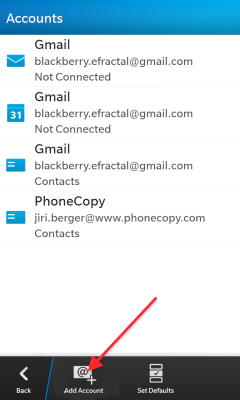 Choose menu Contacts , and select PhoneCopy Active Sync for seeing your contacts .